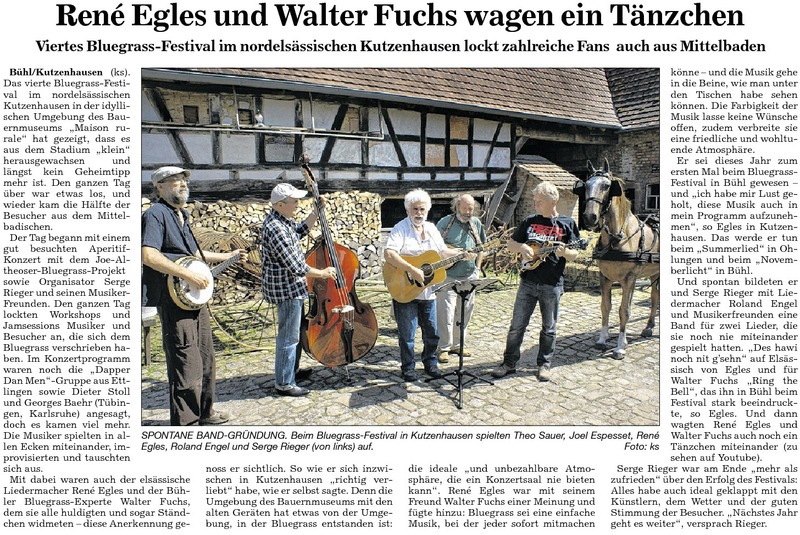 The 4th Bluegrass Meeting in Kutzenhausen, Alsace, is history. 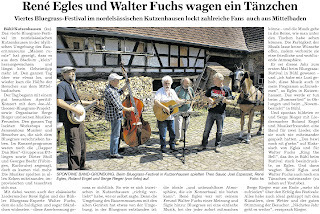 It showed that 'Bluegrass music in Alsace is very much alive and progressing.' The farmhouse in the neighborhood of the rural museum was packed as never before. Folks from France and Germany sat together like a big family. Food, wine and beer was excellent, and everybody had a good time. And of course the music: all groups and bands were in a good mood and presented some fine music - Joe Altheoser Bluegrass Project, Dieter Stoll & George Baehr, and of course the Dapper Dan Men. In the afternoon the famous Alsatian singer/songwriter René Egles showed up, and together with some of the bluegrass musicians he sang 'Ring the bell' (Gibson Brothers) and an Alsatian song. Later in the evening I was suddenly surrounded by seven or eight musicians playing a breakdown, and I was forced to do a flatfoot dance, then René Egles jumped in, grabbed me by the arm, and we did a kind of an improvised folk dance together. We made history. You can watch the last thirty seconds on YouTube - 'René Egles et Walter Fuchs'. I just finished editing a 22 minutes medley of the afternoon show by George Baehr and myself. You may want to add that to Walter's account of the event. ... and we're happy to do so.